On September 15th and 16th, Florida State University and the Society for Musicology will be hosting the 2017 Southern Graduate Music Research Symposium. With a total of 15 participants from institutions as far west as University of Arizona as as east as the University of Limerick, this conference will cover a wide array of fascinating topics in musicology and music theory. Our keynote speaker will be Dr. Sarah Eyerly, Assistant Professor of Musicology at FSU, and opening remarks will be provided by Dr. Patricia Flowers, Dean of the College of Music at FSU. If you are interested in joining our event, you can pre-register here. 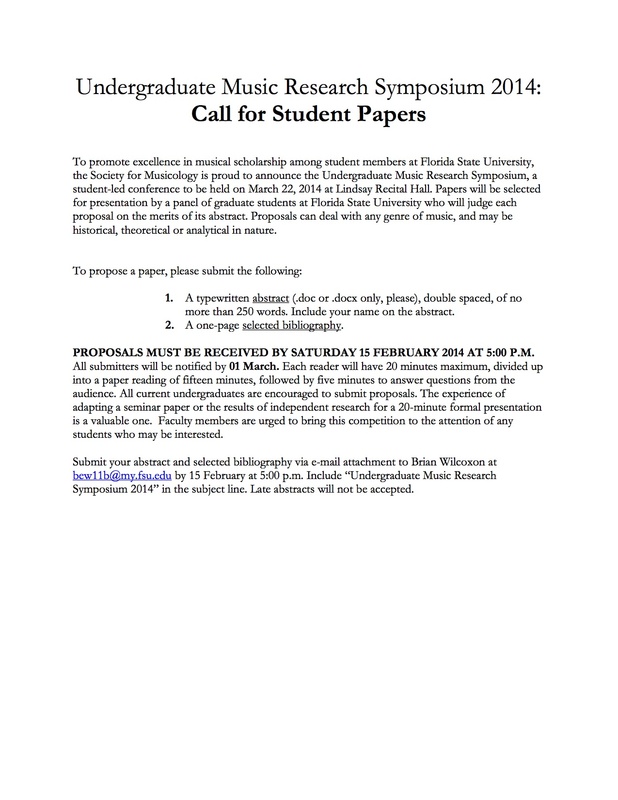 The Society for Musicology at Florida State University is proud to announce the third annual Undergraduate Music Research Symposium, a student-led conference to be held on April 9, 2016. The Symposium serves to promote excellence in musical scholarship among undergraduate students at our institution. Abstract proposals will be selected for presentation by a panel of FSU graduate musicology students. Proposals may deal with any genre of music and may be historical or analytical in nature. words. Include your name and a title for your paper on the abstract. 2. A one-page selected bibliography. undergraduates are encouraged to submit proposals. 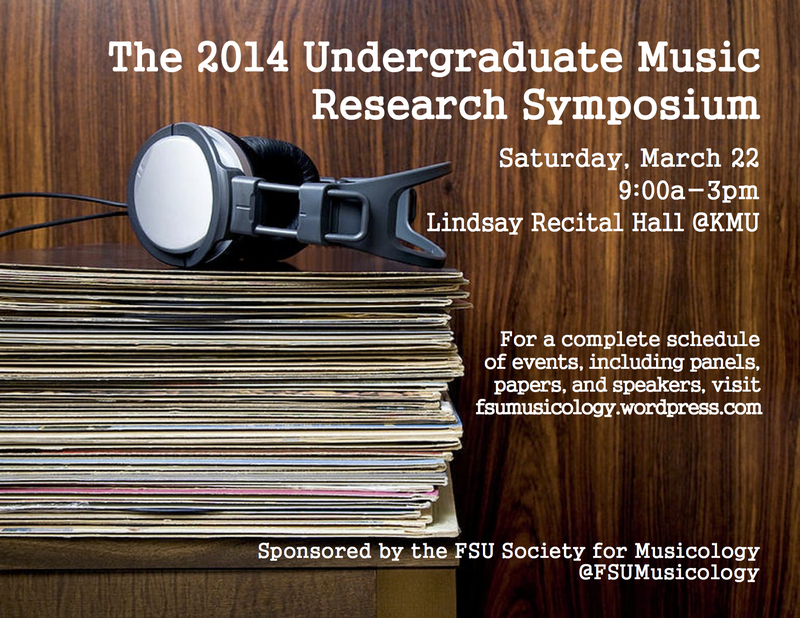 The FSU Undergraduate Music Research Symposium is this Saturday, 22 March from 9am to 3pm in Lindsay Recital Hall. We have a great program in store and are excited to hear some wonderful research! Be sure to RSVP to our Facebook Event. 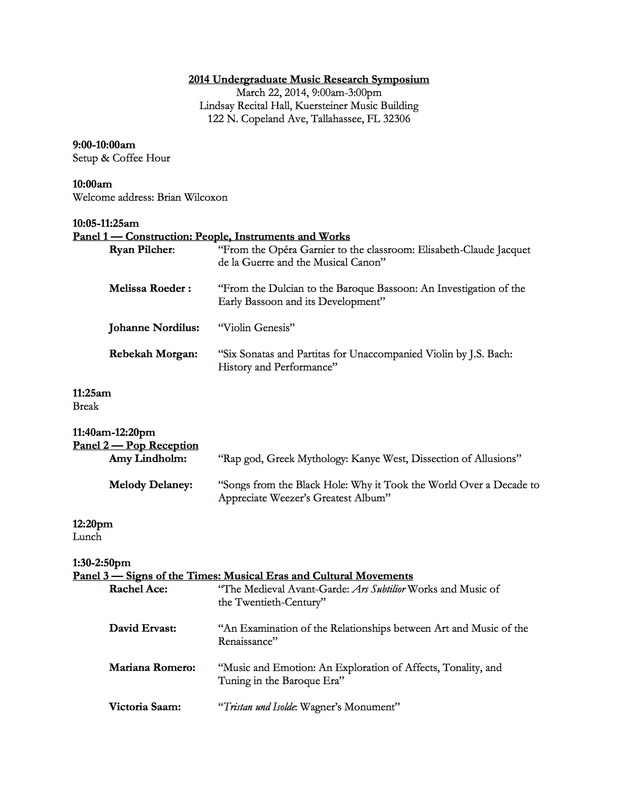 See the full program below or download it here: FSU Undergraduate Music Research Symposium Program 2014. At the close of World War I, the first service of nine lessons and carols was held on Christmas Eve, 1918, at King’s College, Cambridge. Since then, English schools and universities have traditionally marked the end of the fall term with a service of lessons and carols. 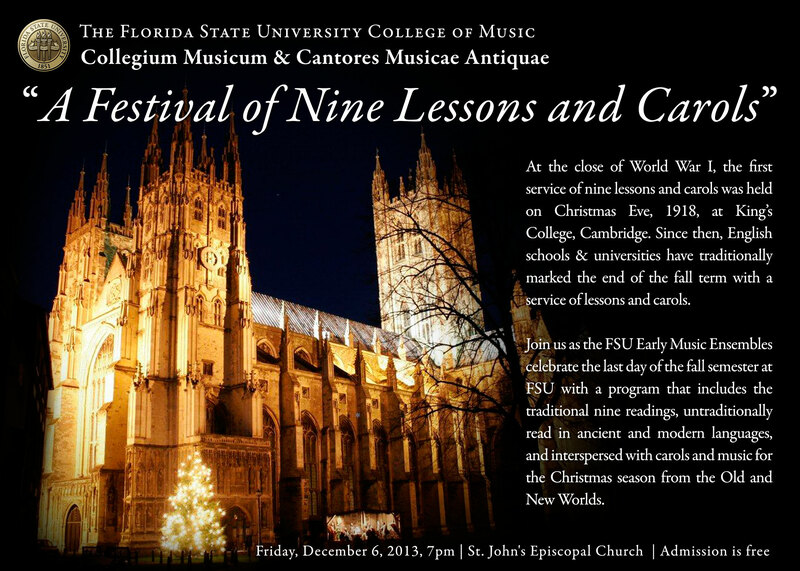 Join us as the FSU Early Music Ensembles celebrate the last day of the fall semester at FSU with a program that includes the traditional nine readings, untraditionally read in ancient and modern languages, and interspersed with carols and music for the Christmas season from the Old and New Worlds.